Animal Aid Unlimited in India discovered a sick dog curled in a ball on the side of the road. He had given up any hope of survival and was prepared to die. 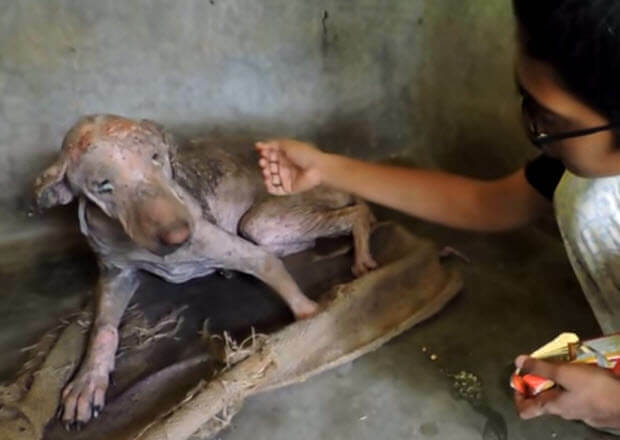 He suffered from one of the worst cases of Mange that the rescuers had ever seen. What is Mange? 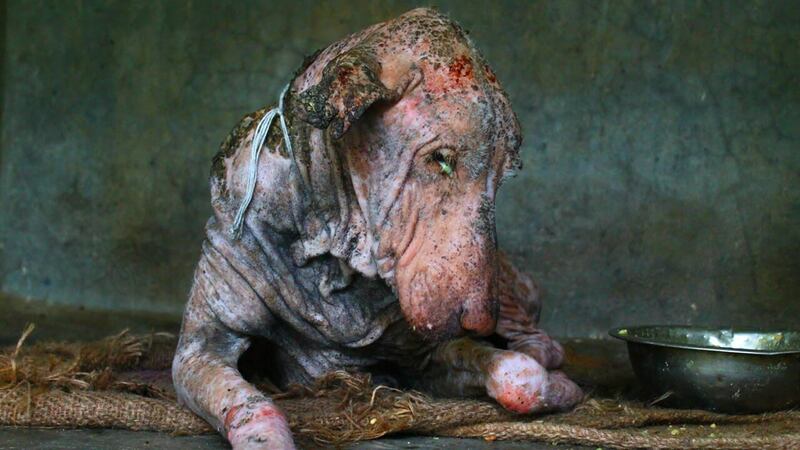 Mange is a highly contagious disease of the skin commonly found in dogs. It’s caused by canine mites or scabies that burrow into the skin. This condition causes intense irritation and itching on the skin of the dogs. The scratching causes their hair to fall out and their skin to become bruised and wounded. IT is a treatable condition but is highly contagious for both humans and other animals. The Rescue It appeared that this dog had given up on life and wanted nothing but to be left alone. Because of this, for both their safety and the dog’s safety, rescuers had to catch him with a large net. They quickly transported him to their rescue facilities to start the healing process. The Healing Process The first day, he was exhausted from his time on the streets and in the heat. He lay in his kennel in a ball and wanted nothing to do with anyone. It was apparent at this state that this poor dog had not received affection or love in quite some time, as he did not want the rescuers to touch him. This Poor Rescued Dog Is Getting Better, But Still Long Way To Go! By day two he started to eat from their hand but still did not want to be touched. By day 10 his transformation was amazing. His skin condition of mange had completely healed.